Photo Details: The aftermath of the accident pictured above left is described in “The RAAF in Vietnam” by Chris Coulthard-Clark (Australian War Memorial 1995), pp 117-119. 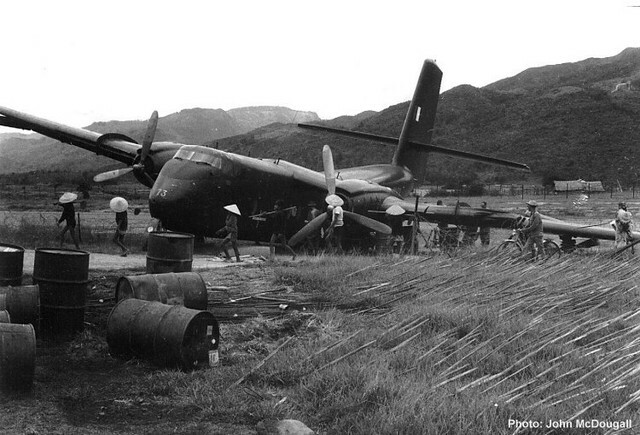 “A party of ground staff was immediately flown in under Wing Commander Melchert, the Commanding Officer, to make an attempt at recovery – an undertaking of considerable urgency since the camp was under direct threat of Viet Cong attack, including from mortar fire. To make A4-173 flyable it was necessary for the team to repair or change the wing, flaps and aileron, engine, propeller and undercarriage, as well as the nose. The essential spares for this work were not available through normal logistic channels, but Sergeant E.G. Allen (an equipment assistant back at Vung Tau) managed to ensure that the replacement parts were obtained; the resourcefulness and initiative shown by this airman were to earn him a mention in despatches. On this day, Prime Minister Sir Robert Menzies announced an order for 18 de Havilland Canada DHC-4/Caribou to replace the DC-3/C-47 in RAAF service. Originally 12 aircraft were ordered with the intention of buying a number of Chinook helicopters; however, when the Chinooks were not going to be available for some years, the Caribou order was increased to 18 and, later, increased again to 29. Under the purchase contract, the de Havilland company provided training for the first crews at at its airfield in Toronto, Canada after which No 38 Squadron at RAAF Richmond assumed responsibility. No 38 Squadron’s first CO, WGCDR T.S. Fairbairn, flew the RAAF’s first Caribou familiarisation sortie on 18 February 1964 and, five weeks later, the first three aircraft departed Toronto for Richmond via Gander (Newfoundland), Lajes (Portugal), Gibraltar, Luqa (Malta), Al Adem (Libya), Khartoum, Aden, Al Masirah (Trucial Coast), Karachi, Calcutta, Butterworth, Jakarta, Darwin and Alice Springs. Some later deliveries were diverted to Vietnam; as an example of the flight duration, A4-173 flew from Toronto to Vung Tau (via a similar route described) during the period 23 July – 29 August 1964, accruing a total flight time of 89 hours and 20 minutes.